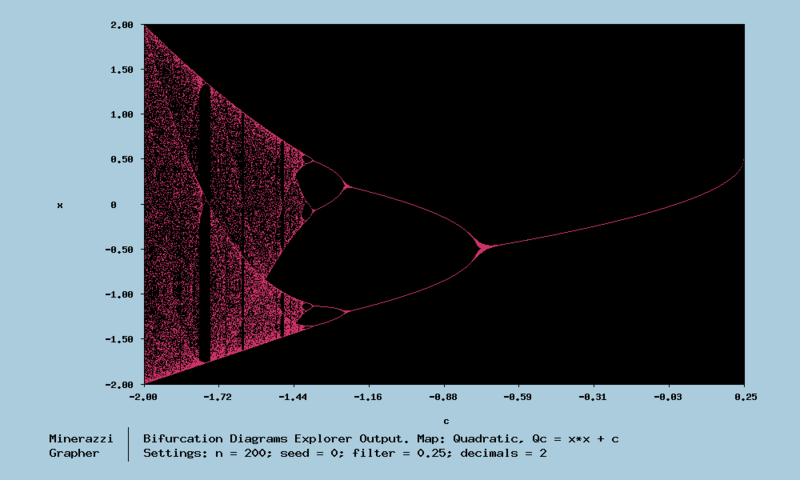 We have recently launched the Bifurcation Diagrams Explorer. This is a tool for examining the behavior of low dimensional nonlinear dynamical systems. Well, what does that have anything to do with information retrieval (IR)? Google search inefficiencies and that popular sites are like attractors on the Web. The growth and evolution of spatial networks can be modeled with bifurcation diagrams. So the implications to social media, search, and data mining are there, if you can grasp the relevant research out there. I wonder how long it will take for pseudo-scientific marketers/seos to prey on that, as they tried in the past with LSI/LSA, LDA, Vector Theory, and few other IR topics. Bifurcation diagrams are used in the study of dynamical systems and are applicable to a wide range of fields: from the modeling of biological populations and financial systems to the modeling of chemical reactions and nonlinear circuits, to mention a few. This tool lets you explore many of the bifurcation diagrams found in the literature, providing a visualization of the underlying behavior of a dynamical system as a parameter c is changed. We assume that you have a basic knowledge of bifurcation diagrams and dynamical systems. The tool is powered by our Minerazzi Grapher, a lightweight PHP class that generates all kind of graphs through a web browser. No additional libraries or software needed. A great resource for introducing users to Chaos Theory.